Our Migrant and Special Services Department provides services to many students here at Willcox Unified. We oversee programs such as ELL, Title One, special education, and the homeless and migrant programs. If you would like more information about our programs or would like to apply for services, please stop by our office or give us a call. We will be happy to talk with you about how we can help support your child in school. Willcox Unified School District offers Child Find screening to locate, identify, and evaluate all children from birth to 21 who may have a disability. If you know a child who has a disability or one you suspect may have difficulty with learning, communication, vision, hearing, behavior, or motor control and coordination, please contact the principal of your child’s school or the Special Education Department at the district. 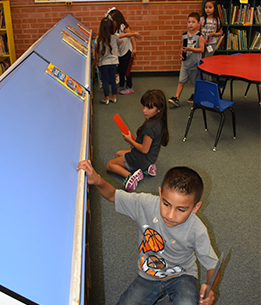 Willcox Unified School District screens children from preschool through high school. We refer infants and toddlers with disabilities to the Arizona Early Intervention Program (AzEIP) for evaluation and services. Preschool screenings are conducted throughout the year and can be scheduled through the special education office. Referrals for school-age children are screened through student intervention teams at each campus. Referrals may be made by teachers or parents. All Child Find referrals are considered confidential, and services are provided at no cost to the family. If it is determined that a full evaluation is needed, informed written parent consent is obtained prior to evaluation. Evaluations are completed within 60 days of informed parent consent. For more information concerning Child Find screening, contact the principal of your local school, or call Kris Duncan, special education coordinator, at (520) 384.8626. A continuum of special education services is provided for students from ages 3 to 21 who meet the eligibility requirements under the Individuals with Disabilities Education Act (IDEA). An individual education plan (IEP) is developed within 30 days of the determination that a child is eligible for services. Parents and teachers (and students as appropriate) collaborate to develop an IEP that provides appropriate services and supports to students, while challenging them to reach rigorous learning goals. Students are educated in the general education environment to the maximum extent appropriate for their individual needs. The individual education plan (IEP) is developed and reviewed at least once each year. Reevaluations are conducted at least once every three years. Special education records are maintained in the special education office for five years after final enrollment in special education. They are destroyed five years after a student has withdrawn, transferred, or graduated. Before records are destroyed, parents/adult students may review and/or request copies of records by contacting the Special Education Department. The total school community (parents, students, personnel, and community members) shares in the responsibility for maintaining a positive and safe learning environment. This includes the responsibility to teach and reinforce appropriate behavior. IEP teams collaborate to develop and implement plans for positive behavior supports, and teaching of behavior and social skills, as needed. Staff members are trained in positive behavior strategies, including the use of Crisis Prevention Institute’s Nonviolent Crisis Intervention©. For information regarding discipline, including suspension and expulsion procedures, please refer to the student handbook for your child’s school, and to the procedural safeguards.